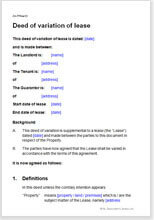 This is the document you need to record agreement to change the terms of a commercial (non-residential) lease. Like the original lease, it is an agreement between landlord and tenant. It does not matter what terms you want to change. The lease can be of any property, and for any length of time. The document is a deed because the original lease is a deed. The document includes simple examples of things you might want to change. You can use your own words to record what you have agreed. It is a good idea not to use a deed of variation if the changes you want to make go to the heart of the transaction, for example, by adding extra property or an additional tenant. We shall not provide a list of contents because the deed is simply a legal structure to contain the text which is the agreement between landlord and tenant. This document requires a witness to the signature of each party. There is no other requirement for action after signing. Just each keep a copy with your copy of the lease, signed by the other of you.